Teresa P. Diaz-Montes, M.D., MPH, FACOG is a noted expert and gynecologic oncologist with The Gynecologic Oncology Center at Mercy, a leading Center in Baltimore for the treatment of cancers of the female reproductive tract. She is board certified in Gynecologic Oncology. Her primary clinical interests include ovarian cancer treatments, minimally invasive gynecologic surgery, including robotic surgery, and patient safety and quality. Additional areas of interest include fertility-sparing surgery and management. Dr. Diaz-Montes, an author and international lecturer, has numerous clinical publications related to women’s cancer treatment to her credit. Polycystic Ovarian Syndrome (PCOS) and it Relationship to Endometrial Cancer: What is important to know? 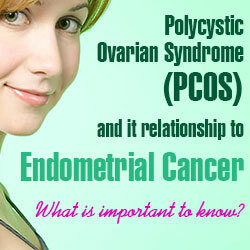 Polycystic ovarian syndrome (PCOS) is one of the most common endocrine disorders among women of reproductive age. It affects between 1 in 10 to 1 in 20 women with an estimated 5 million women affected with this condition in the United States. Its etiology is uncertain, however, there is strong evidence suggesting that it is a genetic disease. POCS is characterized by a hormonal imbalance. Women with PCOS have high levels of estrogen and abnormally low levels of progesterone. The ovaries of women with PCOS also make more androgens than normal. The hormonal imbalance impact the ability of the women to ovulate. Women with this condition usually have problems with fertility. One of the most common symptoms of PCOS include menstrual disorders. This could range from a women experiencing a few menstrual periods (oligomenorrhea) to no menstrual periods (amenorrhea). PCOS is consider to be one of the leading causes of infertility. This is a direct results from lack of ovulation (anovulation). The presence of high levels of masculinizing hormones may cause acne and hirsutism (male pattern of hair growth). However, the high levels of androgens could cause heavy and prolonged menstrual periods, increase hair thinning or diffuse hair loss. PCOS has also been associated with insulin resistance causing obesity, diabetes and high cholesterol levels. Endometrial cancer is a form of uterine cancer and is the most common gynecologic cancer diagnosed among women living in the United States. Hormone levels play a big role in the development of endometrial cancer. Particularly women with high levels of circulating estrogen, like women with PCOS, are at increased risk. Progesterone is the hormone responsible for the monthly shedding of the uterine lining or endometrium. Without this shedding, the endometrium becomes thick and the cells may become altered leading to a condition known as endometrial hyperplasia. Androgens are converted to estrogens in the ovary and the adrenal glands. Excess androgens in women with PCOS leads to increase levels of estrogens increasing the risk of endometrial hyperplasia. If endometrial hyperplasia is left untreated, this can progress to endometrial cancer. Women with PCOS are at increased risk of endometrial cancer development. It has been reported that women with PCOS have a 5-fold increased incidence of endometrial cancer. Endometrial cancer is typically diagnosed among women who approach the menopause or are postmenopausal. In PCOS, endometrial cancer and endometrial hyperplasia may occur at a younger age. This could had profound impact in the ability of the women fulfilling fertility. The nature of the endometrial cancer in a younger women with PCOS is relatively benign with a good prognosis. Even though the standard of care of endometrial hyperplasia and/or endometrial cancer is a hysterectomy, women who desired to preserve fertility could be safely treated with hormonal therapy. It is clear that early diagnosis of PCOS is key in decreasing the risk of endometrial cancer development. Affected woman should not be allowed to have prolonged intervals without menstrual cycles. The intermittent use of progesterone therapy at monthly or at 6-8 week intervals is a major preventive therapeutic option to minimize the risk. When a woman experiences excessive menstrual periods, especially in a setting of infrequent or virtually absent menstrual cycles, further evaluation is warranted. Evaluation modalities include pelvic sonogram and dilatation and curettage. If endometrial hyperplasia or carcinoma are diagnosed, high dose progesterone therapy can be consider if women meet certain qualifications. Follow-up evaluation include periodic endometrial biopsies to ensure adequacy of treatment. If progesterone treatment is not capable of reversing the carcinoma then a hysterectomy should be performed. The institution of insulin sensitizing agents, like metformin, oral contraceptive therapy and measures to reduce obesity in the treatment of PCOS are treatments in minimizing the risk of endometrial carcinoma in women with PCOS.